I love making fudge. It is my favorite sweet treat. I don’t make it very often, since I try to watch my weight, but Christmas time is when I forget about that and make batches of it to eat and to share. This recipe for white chocolate mosaic fudge uses green and red cherries to give the fudge a mosaic jeweled look. This makes it just perfect for Christmas. The recipes makes about 2 1/2 pounds of fudge (36 squares) and each one has about 125 calories. It is so easy to make and almost fool proof. 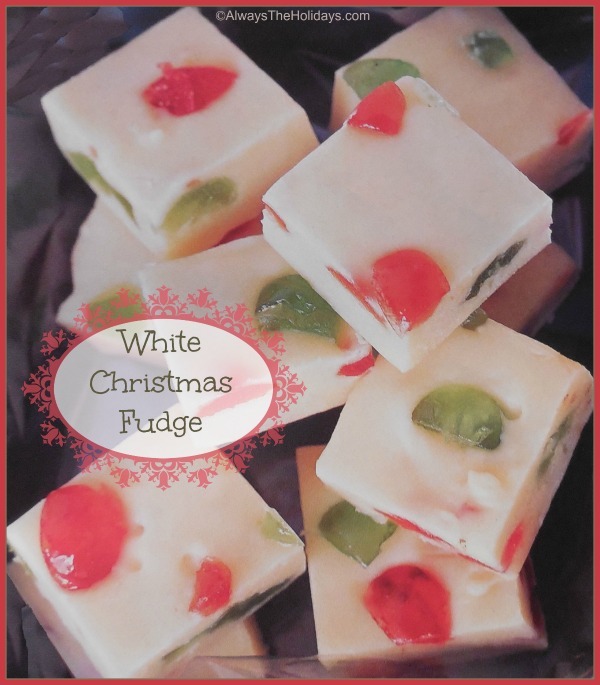 This fudge is very festive and would make great homemade Christmas gifts. 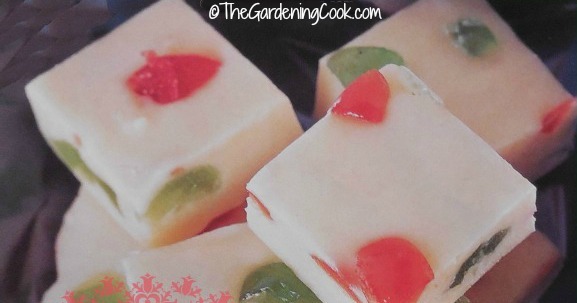 The red and green cherries add a delightfully festive look to the fudge and also add a nice taste to the sweetness of the white chocolate chips. Candy Tip: Line your pan with a silicone baking mat. (affiliate link) The ingredients won’t stick to it and you can just peel off the mat when the fudge is done. Makes it a cinch! To give as a hostess gift, line a festive box with some tissue paper and add the fudge, with a small card for the recipe. Your friends will be delighted with your thoughtfulness. I promise, that once you make this fudge, it will be on your Christmas list every year! Line a 9" pan with foil. In a saucepan, heat the chocolate with the condensed milk, vanilla extract and salt over a low heat. Heat until it is melted, stirring occasionally. Remove from the heat and stir in the chopped cherries. Spread the mixture into the prepared pan. Chill in the fridge for 2 hours or until it is firm. Turn the pan over and carefully remove the foil. Cut into 36 squares. Store in an airtight container in the refrigerator. New and amazing Recipe . thanks for sharing this yummy recipe for us. Yes ! I’ll be try your recipe soon.